A heat flux sensor is primarily a transducer which is used to determine the total heat that is applied onto a surface. Based on the amount of heat generated on the surface, an electrical signal is generated directly proportional to heat flux generated. Heat flux sensors are used for a number of applications for testing and measurement. They can be used to study the heating effect on building structures based on which relevant thermal resistive material can be applied. They can also be used in testing of vehicles to see how much heat flux is generated when these vehicles are subjected to various levels of stress. A growing application for heat flux sensors is their use in the construction of green buildings. One of the main aspects of a green building is that the power consumption of these buildings are bare minimal. In order for this to take place, it is necessary to determine where and how much heat flux is created at different parts of the building so that relevant construction material can be applied for better heat distribution. 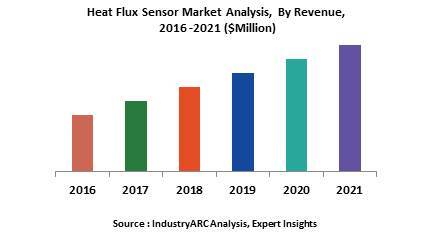 A new area where heat flux sensors have been used off late is that in agriculture. Usually, a number of sensors are placed across the soil to determine how much energy is stored in the soil. Based on this, the type of crop that can be used or the amount of water that can be used can be determines scientifically. As such, heat flux sensors have a wide variety of applications wherein they can be used to determine the heat dynamics of a structure and accordingly the effectiveness of the structure or product can be determined. The demand for heat flux sensors is expected to increase during the forecast period with a number of applications requiring testing and measuring. Further to this, there are a number of R&D centres that are being setup in order to look at effective thermal management where minimal material is required. The APAC region is expected to post the highest growth rate with the majority of the R&D centres being located here.